Knoxville 98; East Troy 00; Atlanta 03; DC 06; Ryman (EV) 09; Noblesville 10; East Troy x2 (PJ20) 11; Wrigley Field & Pittsburgh 13; Cincinnati & St. Louis 14; Lexington & Wrigley Field x2 16; RnR HOF Brooklyn and Bourbon & Beyond Louisville (EV) 17; Wrigley Field x2 18. Having only had the chance to go to one night, I'm glad I got night one! Both great shows, but 7 tracks from TEN was a treat. Tonight they get 6 covers leading the way. Pretty cool that there are just 4 repeats between the 2 Fenways so far. This set has not wowed. Just going based off the likes that PJ gets on instagram. Seattle Night 2 is around 20,000 likes more then any other setlist in these home & away shows. if that doesn’t tell you what the fans want to hear then I just don’t know anymore. I think they are working hard to play what the fans like and what they like to play. Not every show can have ten thousand rarities and stuff, the people there at the show in the videos look to be having a good time. Listen to how much the crowd is loving the show in the scopes, if that doesn't tell you what the fans think idk. I was expecting more for Boston but still awesome. Hard for this band to surprise though when they have done just about everything. ...at the risk of being mocked, I see that word "tag" on setlist.fm and I've never known what it means. Just a snippet or a tease? Think of how Daughter often goes into a verse of Another Brick in The Wall (or any number of other songs) before coming back to finish out the song. Was there for N1 and it was unbelievable, only wish I didn't have to work and could have stayed for N2. Would have loved to hear Arms Aloft/Imagine and Red Mosquito is always nice to hear. I'm already jonesing for more shows. when did they do sound check? Dimitris, your the best. Thanks for your efforts as always, that was a fun tour. Bounced when they started Alive to see if Nadal's going to get upset too... decisions, decisions! That was probably more special for people from Boston is my feeling though... yeah? Beautiful weather and neat to be in a pro baseball stadium for my first time. Band looked to be feeling great too, which is always nice! Wish there was a GA area though. And that it sounded better... or, I guess, "LOUDER..." Hard to really sing sitting a few rows in front of the soundboard when i seemed to drown out Ed. 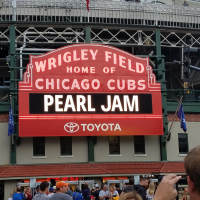 Very glad I got to go, and the show was good... definitely won't make it a priority to go to a stadium show again though. Not the venue for me! Looking to make show #20 in 2020 now. C'mon new album! Another great tour in the books!